Weighty Matters: Exercise - the Videogame? This one's for the Nintendo Wii and it's called Wii Fit and currently it is the number two selling video game in Japan (it's not available in North America yet). For those of you who don't know, the Nintendo Wii is a video game console whose controllers have motion sensors and so games on the Wii are played more actively. 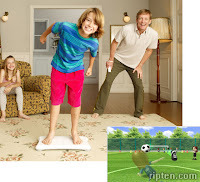 With Wii Fit we see the addition of a balance board sensor. While I can certainly envision its use in areas like stroke rehabilitation, Wii Fit just doesn't do it for me. I'm a gamer (at least I used to be before having children) and these really don't look like games to me. My advice? If you want exercise, go outside and play. If you want to play video games, play video games. Please don't waste your money on a product that will do little for you in the way of exercise and as far as fun quotient goes....well, I don't want be seen as a stick in the mud, so here is Sarcastic Gamer's overdubbed parody of the original Wii Fit trailer.